I recently signed a contract with Crooked Cat Publications for my second novel, An Accidental King. Set in the 1st Century AD, it is the fictionalised autobiography of Tiberius Claudius Cogidubnus, a native British King who sought rapprochement with the Romans. The book needs one final edit, which I am currently working on, and we will then set a publication date later in the year. In the meantime, I will be sharing some of my sources and research notes here. So here is the starting point - a place, Fishbourne Roman Palace, near Chichester in West Sussex. I first visited it with my parents and my sister on our annual holidays when I was about ten years old. Already fascinated by archaeology and history, I had spent a great deal of time exploring the prehistoric archaeology of Jersey (where we lived), but there was little Roman archaeology there, so these visits were a rare treat for me, and set me wondering about who might have lived there, and what their lives might have involved. Fishbourne is called a "palace," rather than a "villa," for good reasons. It is by far the largest, and most opulent, Roman residence ever found in the British Isles but, intriguingly, it is also one of the earliest. 1) A Roman military site with granaries, built shortly after 43 AD (the date of the Roman invasion of Britain). 2) Two impressive buildings, in the Roman style, each with 6-7 rooms, built in the late 40s or early 50s AD. At least one of these appears to have been a high-status residence. These buildings were probably of timber on stone foundations, with painted plaster on the walls and tiled roofs. 3) A substantial stone-walled residence (the "Neronian Palace"), with baths and a courtyard garden, built in the mid 60s AD. 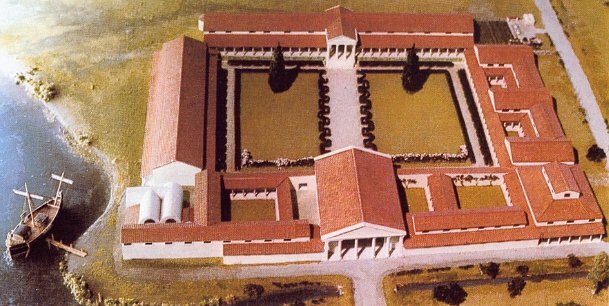 4) A much larger and more lavish residence (the "Flavian Palace"), built in the early 70s AD. 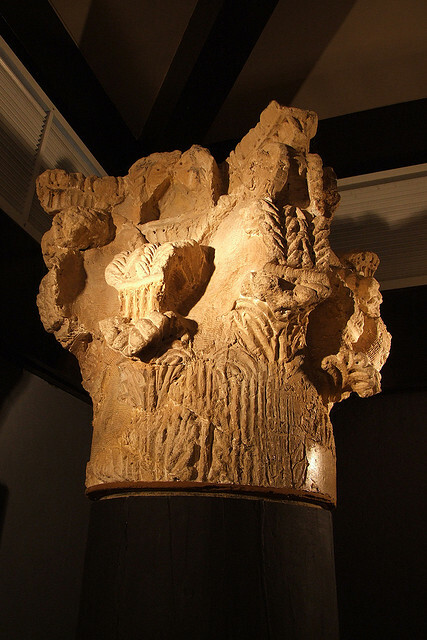 The "Neronian Palace" is not entirely unique (similar buildings have been found at Angmering and Silchester - Fulford 2008), but its carved columns and mosaic floors are, in the British context, very early, and could hardly have been made by British craftsmen. 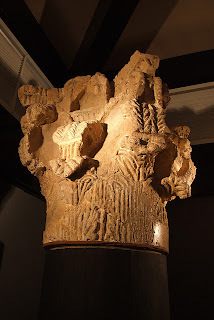 Column from the "Neronian Palace." The "Flavian Palace," on the other hand, is utterly unique, not only in Britain, but in Europe north of the Alps. 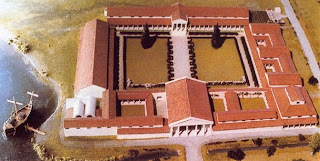 With a larger footprint than Buckingham Palace, a formal audience-chamber, and an aisled hall with a public as well as a private entrance, the only points of comparison are with a handful of palaces in Italy, prominent amongst them Nero's "Golden House," the building of which had scandalised Roman society. Model of the "Flavian Palace." 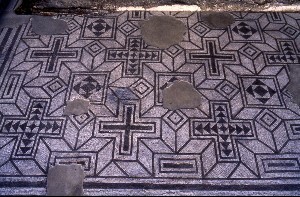 Mosaic floor from the "Flavian Palace." 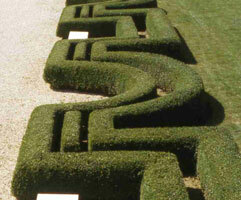 Part of the reconstructed garden of the "Flavian Palace." What is such a palace doing in rural Sussex? Who lived there? What had they done to deserve the patronage that must have been involved in building it? We may never know the full answers to these questions. I will, of course, provide answers to them in the novel, but they are not answers which I could advance in an academic context, because there is no evidence to support them. I believe, however, that they are, at least, compatible with the facts as they are known. Most but not all authorities consider it likely that the palace was the seat of Tiberius Claudius Cogidubnus, a British king of the 1st Century AD, who is recorded as having been a loyal ally of Rome. I have followed this judgement, exploring, in particular, his relationship with the Emperor Vespasian, within whose reign the "Flavian Palace" was built. B.W. Cunliffe 1971a Fishbourne: A Roman Palace and its Garden. London, Thames & Hudson. B.W. Cunliffe 1972b Excavations at Fishbourne, 1961-67. Vol.1. 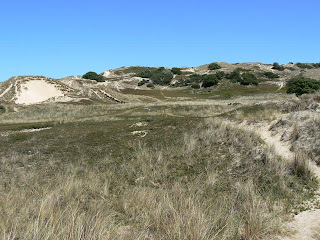 The Site. Vol.2. The Finds. London, Society of Antiquaries. M. Fulford 2008 "Nero and Britain: The palace of the client king at Calleva, and Imperial policy towards the province after Boudicca." Brittania, 39, 1-13. My mother, Valerie Grace Patton, sadly passed away on 10th January, following a short illness. Born in 1939 in Seaford, Sussex, her early life was inevitably shaped by the Second World War. Her father, Joseph James Chrismas, served with the Royal Engineers, helping to build the Mulberry Harbour in the weeks following D-Day. Her uncle, Frederick William Haynes, serving with The Buffs, was decorated for bravery in Italy – he spent a whole night stretchering the wounded off the battlefield under heavy fire. She herself was evacuated to Cheltenham when a Nazi invasion looked likely, but returned to Seaford before the end of the war, and could remember standing in the garden and watching a “doodlebug” (V1) flying over. 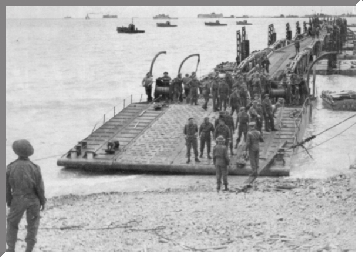 Mulberry Harbour in Normandy, which my grandfather helped to build. As a young woman, she was caught up in the mood of heady optimism that followed the end of the war. She was one of the first cohort of nurses who helped to build the NHS. Many, including her own mother, told her she was not up to this role, but she proved them wrong, nursing with commitment and dedication, first at the Queen Elizabeth Hospital for Children in London, and then at the General Hospital in Jersey. 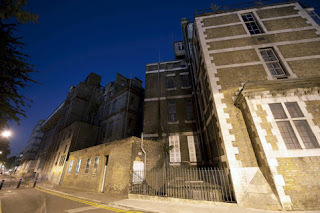 Queen Elizabeth Hospital for Children, Hackney Road, where my mother nursed. It was in Jersey that she met my father, John Francis Patton, a hairdresser from Strabane in Northern Ireland. They married in 1964 and I was born shortly afterwards (1965), followed by my sister, Amanda (1967). There is so much I could say about our childhood in Jersey but, more than anything, my mother imbued us with a sense of wonder about the natural world. There were long walks along the cliffs of Jersey’s north coast, and across the sand-dunes of the west; afternoons spent fishing in the rock-pools at Noirmont Point, always stopping to identify the birds, animals and plants we saw along the way. There are, of course, echoes of all of this in the pages of Undreamed Shores, as well as in my academic writing. The sand dunes of Les Blanches Banques. We walked our dogs and enjoyed picnics here. It is also the "Bildosola" of Undreamed Shores, and the highest point on the photograph is where Meruskine speaks to Amzai, Nanti & Gwalchmai. Then, of course, there was our love of literature itself. I learned to read before I went to school (to the disgust of my first teacher, who believed that only the prescribed method of teaching was appropriate) and, thereafter, we visited the public library in Saint Helier regularly, borrowing and reading three books each week, generally a mixture of fiction and non-fiction. My interests crystallised quite rapidly: by the age of ten I was reading a great deal of historical fiction (Rosemary Sutcliff, Mary Renault, Henry Treece), archaeology (Glyn Daniel, Jacquetta Hawkes, Mortimer Wheeler) and anthropology (Sonia Bleeker), none of which will surprise anyone who reads my books. Our annual holidays, when we could afford them, typically involved a week at Christchurch, rambling through the New Forest, visiting Salisbury Cathedral and Stonehenge for the first time; followed by a week at Seaford with Grandad, Uncle Fred and other relatives. Fishbourne Roman Palace made a convenient stopping off point on what seemed the epic journey between Dorset and Sussex (I have to laugh at this perception now, but it was the authentic perspective of a child growing up on a tiny island, and my memory of it explains why I have written the character of Amzai in the way I did), and this started me wondering about the questions that led me to write my second novel, An Accidental King, scheduled for publication later this year and dedicated to the memory of my parents. In later years, my mother was able to travel to a far greater extent than was possible when we were all younger (I think she and my father pretty much covered up the material sacrifices they had to make to give Amanda and I the best possible start in life). She made three trips to Australia to visit her younger brother, Joe, and two trips to India, which Amanda and I shared with her (Amanda is married to Caj, whose family are Indian). It opened up a whole new world for her, a world that she secured for us through education before even tasting of it herself. 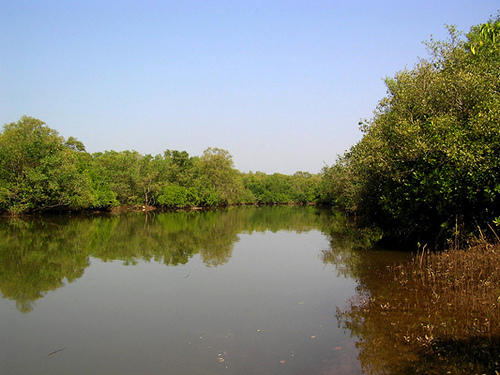 One of my happiest memories is a day of bird-watching from a boat on the backwaters of the Mandovi River, where we saw ospreys, golden orioles and four species of kingfisher, among many others. The backwaters of the Mandovi River, Goa. Now that she has gone, it falls to us to make full use of the opportunities she opened up for us, and to do whatever we can to open up those opportunities for others.